At Edvotek, we always want the best for our customers, which is why we are constantly improving our products to meet their highest quality standards. You may have noticed that in the last few years, we have improved our website to deliver information in a clear, concise manner. We have also improved the design of many of our products including our electrophoresis units. We continue to innovate to make teaching and learning easier and more enjoyable for our customers. With all the changes we have made, we want to point out the changes made to our component labels and our Safety Data Sheets (SDS). In this post, we will explain the importance of these changes and the benefits of the new SDS and product labels. 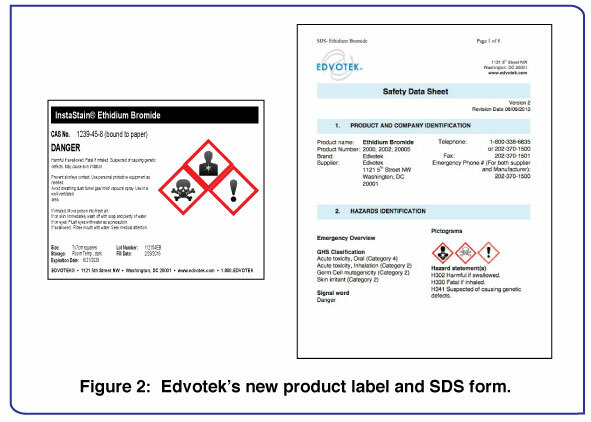 Edvotek revised our existing Material Safety Data Sheets (MSDS) and component labels to comply with the Globally Harmonized System of Classification and Labeling of Chemicals (GHS) adopted by the United Nations. This agreement requires different nations to adopt a standardized form of chemical hazard communications, which facilitates international trade by increasing the consistency of the laws between countries. The agreement especially reinforces the systems of classification and labels of chemicals to improve production, transport, handling, use, and disposal of hazardous materials. The U.S. officially adopted the GHS on March 26, 2012 and the agency in charge of integrating the system is the Occupational Safety and Health Administration (OSHA). As part of the integration OSHA aligned the existing Hazard Communication Standard (HCS) with the GHS. 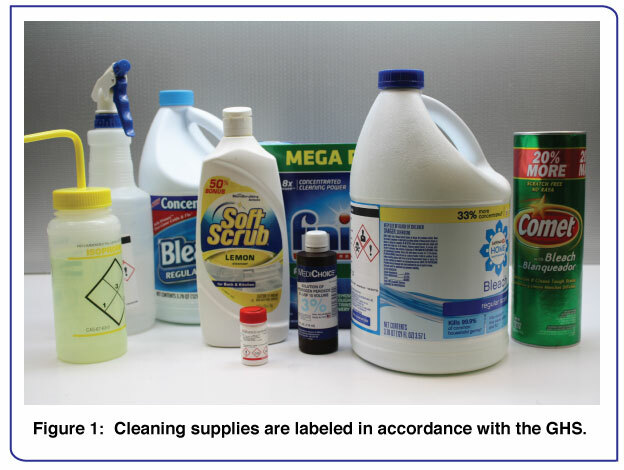 This hazard reporting system applies not only to companies like Edvotek, but also to companies producing pharmaceuticals, pesticides, and cleaning supplies (Figure 1). The target audiences for GHS include production workers, personnel involved in product transportation, emergency responders, and consumers. Previously, customers received MSDS with a lot of information about the hazards with each product. However, that information was often difficult to read and understand. To address this, Edvotek reviewed its chemical products and has carefully classified and labeled such products in compliance with the OSHA requirements. There are two specific changes in our products: new SDS and new labels for some chemicals (Figure 2). When required a new label will include a harmonized signal word, pictogram, hazard and precautionary statements. All SDS for our chemical products are arranged into sixteen sections that will easily explain the hazards of the chemical products in a concise manner (Figure 3). The following explains the contents of each section. • Section 1, Indentification includes product identifier; manufacturer or distributor name, address, and phone number; emergency phone number; recommended use; restrictions on use. • Section 2, Hazard identification includes all hazards regarding the chemical and required label elements. • Section 3, Composition/information on ingredients includes information on chemical ingredients and trade secret claims. • Section 4, First-aid measures includes important symptoms/effects (both acute and delayed), and required treatment. • Section 5, Fire-fighting measures lists suitable extinguishing techniques and equipment, and chemical hazards from fire. • Section 6, Accidental release measures lists emergency procedures, protective equipment, and proper methods of containment and cleanup. • Section 7, Handling and storage list precautions for safe handling and storage, including incompatibilities. • Section 8, Exposure controls/personal protection lists OSHA’s Permissible Exposure Limits (PELs), ACGIH Threshold Limit Values (TLVs), and any other exposure limit used or recommended by the chemical manufacturer, importer, or employer preparing the SDS when available. Also includes appropriate engineering controls and personal protective equipment (PPE). • Section 9, Physical and chemical properties lists the chemical's characteristics. • Section 10, Stability and reactivity lists chemical stability and possibility of hazardous reactions. • Section 11, Toxicological information lists chemical stability and possibility of hazardous reactions. • Section 16, Other information, includes the date of preparation or last revision. 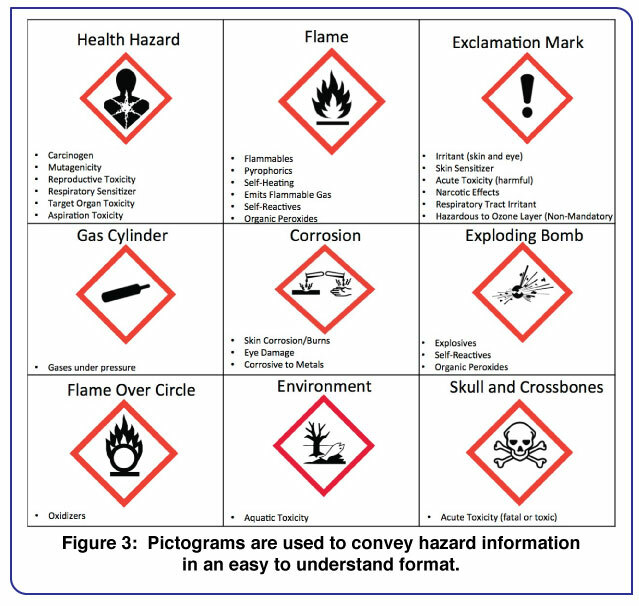 In compliance with the GHS recommendation, the new product labels contain pictograms to alert users of the chemical hazards to which they may be exposed. Each pictogram consists of a symbol on a white background framed within a red border and represents a distinct hazard. The pictogram on the label is determined by the chemical hazard classification, which corresponds to section two of the SDS (Figure 3). A specific product label may have multiple pictograms depending upon its chemical properties. At Edvotek, we are proud to provide safe, quality laboratory experiences for your school, community college, or university. We want to ensure that every student, professor or product user is safe and that our products are handled in a safe manner. In implementing the new OSHA requirements, Edvotek is enhancing customer understanding of product hazards, reducing confusion in the workplace, facilitating safety training, and providing our customers with more efficient access to safety information. We hope you enjoy teaching and learning with Edvotek!